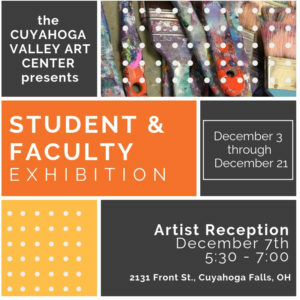 The Cuyahoga Valley Art Center (CVAC) would like to invite you to our 2018 Student & Faculty Exhibition to be on display from December 3 – December 21, 2018. This exhibition displays the talents of our world-renowned faculty and their students by providing our community with an insider’s look at the significant art being produced here at CVAC. Showcasing CVAC’s Students’ and Faculty’s recent paintings, sculpture, ceramics and works on paper, this exhibition reveals the breadth of interests and investigations that take place within our classrooms and workshops. This popular annual exhibition kicks off with a People’s Choice selection process. We invite the public to participate in our People’s Choice voting process that will select the Best of Show, Second-place and Third-place awards. This voting will conclude at 6:30 PM during the Artist Reception to be held on Friday, December 7th from 5:30-7:00 PM in the main gallery.